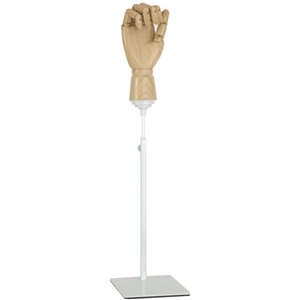 This versatile and beautifully crafted hand display features fully bendable fingers, woodgrain finish and an adjustable base. Create an eye-catching pose to display your products with the flexible hand display. • 5" W" x 5-1/2" D" x 19 H"
• Adjustable height 19" to 26"
• White base 5-1/2" x 5"